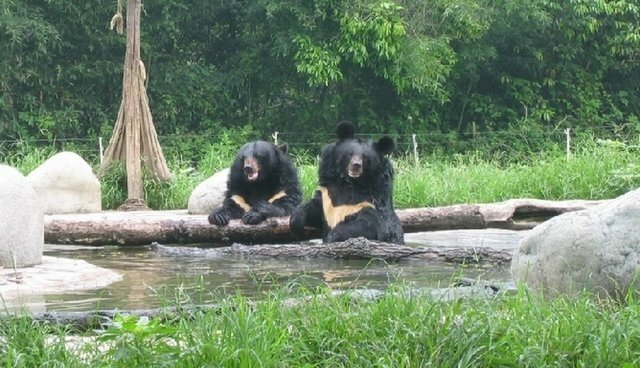 The first sweltering days of summer have arrived at Animals Asia's bear sanctuaries in both China and Vietnam, which can mean only one thing - time to get in the pool! 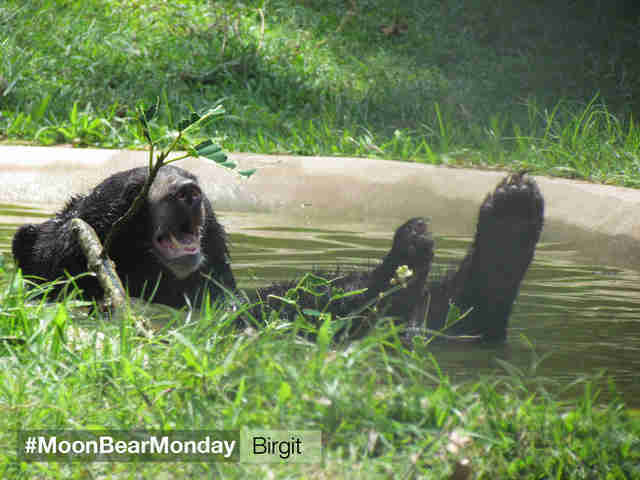 Bears rescued from the bear bile farms absolutely love cooling off and relaxing in water. And who could blame them? 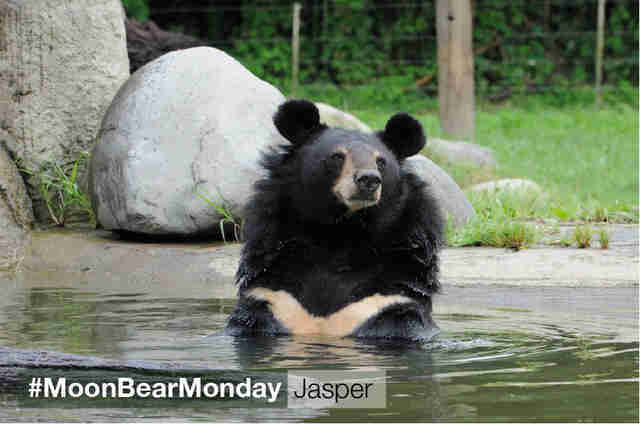 While held captive, the bears often have no access to drinking water, let alone a pool to find much needed relief from tropical temperatures. 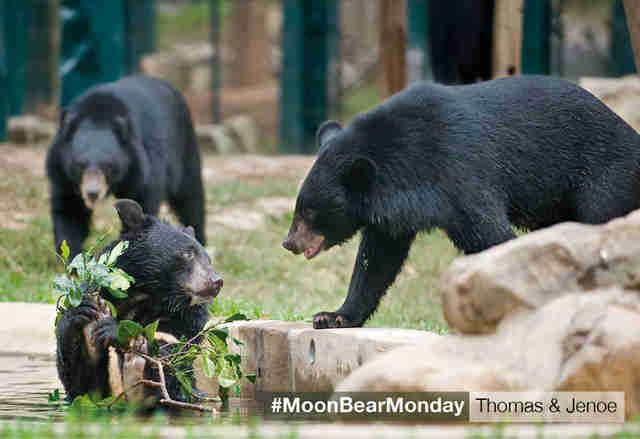 Bears can endure up to 30 years in tiny cages suffering invasive bile extraction as the liquid produced by their gall bladders is desired for traditional medicines. Sadly, most are starved, dehydrated and suffer from multiple diseases and malignant tumurs that ultimately kill them long before they reach such an age. 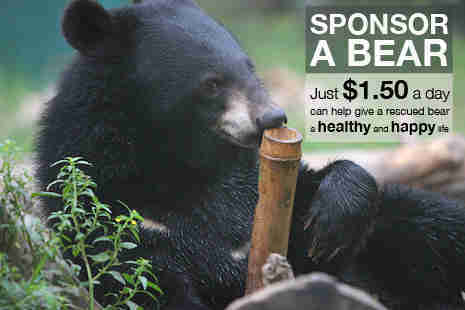 But for the bears fortunate enough to have been rescued by Animals Asia, their horrific past is a distant memory. Now they are free to swim, wrestle, splash or just sit in the shallows with their favorite treat and watch the world go by. 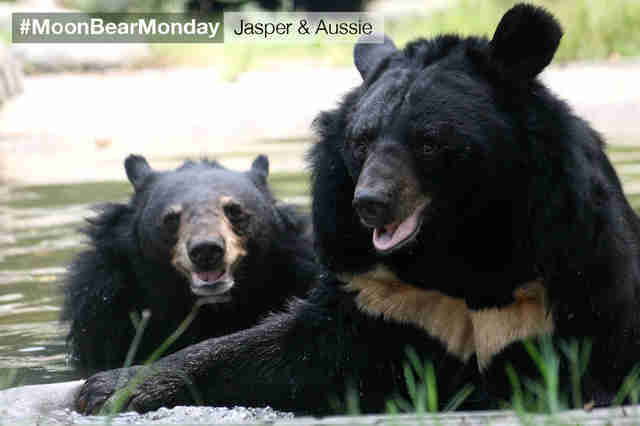 It's all smiles at this moon bear pool party as Jasper and Aussie emerge from the water's edge. 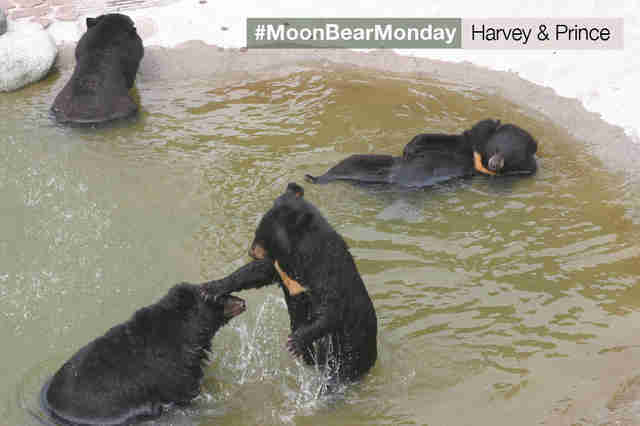 Harvey relaxes in a prime pool-side pose to watch Prince and his opponent in the Moon Bear Pool Wrestling Championships. Gorgeous Jasper watches the world go by from the poolside. Thomas' face is the picture of innocence as his pool party for one is interrupted by Jenoe. In his efforts to keep his tasty browse for himself, Thomas holds on with both hands - and a foot as well. Beautiful Birgit floats away on her back, while enjoying her favorite snack. 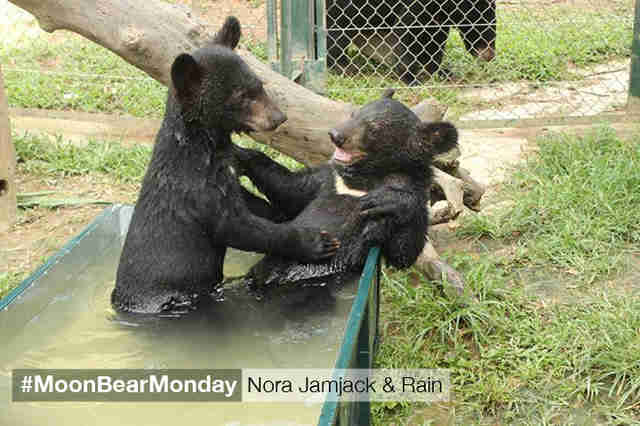 When they arrived at our Vietnam sanctuary as cubs, twins Misty and Rain couldn't be kept out the pool - and once even enjoyed a dip in some bubble bath. On an especially hot day there was no keeping these two from the pool. 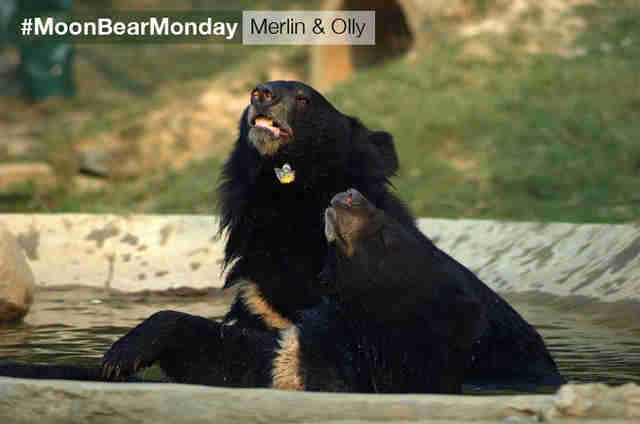 Just as our photographer tried to capture their relaxation, a butterfly fluttered into shot landing momentarily on Merlin's nose. The picture captures our gentle giant exhaling, blowing the butterfly back into the air with his warm breath. An idyllic moment. 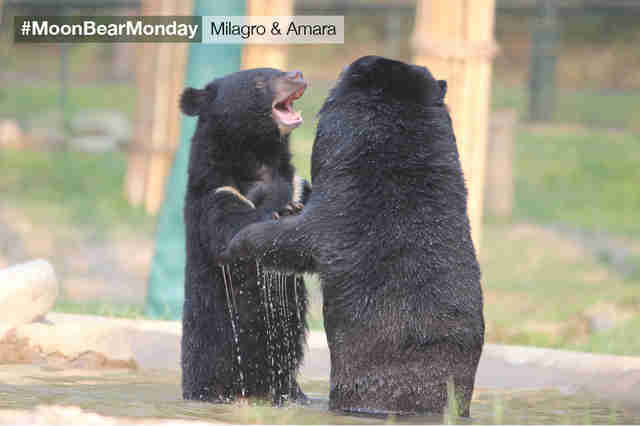 Best pals Milagro and Amara enjoy a friendly tussle in Animals Asia's Vietnam sanctuary pool. 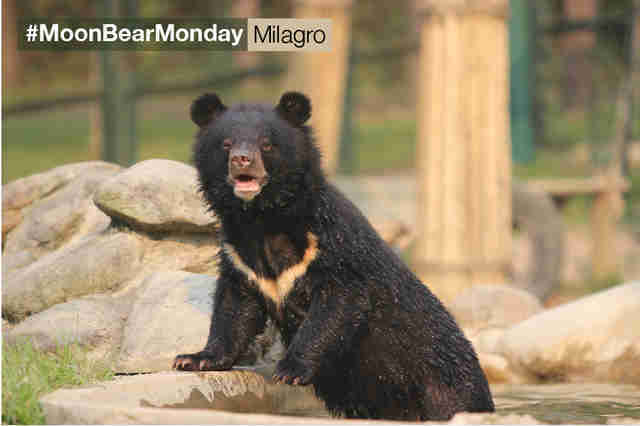 But Milagro is left a little bit ruffled - perhaps the water was too cold? 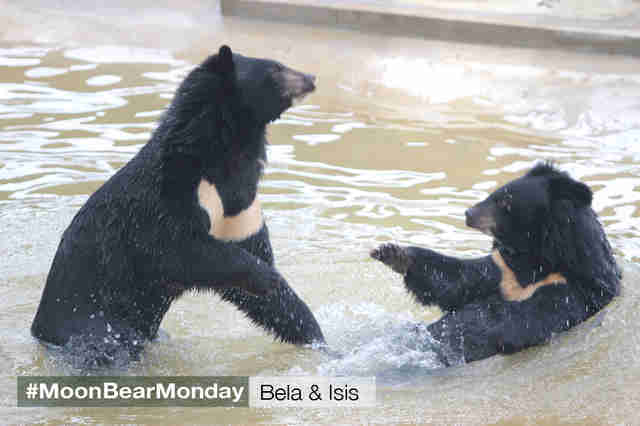 The fun is just about to start as this playful couple at Animals Asia's Vietnam bear sanctuary prepare to chase each other around the pool.